The Bollards on the Beach. River and beach, what more could you want? 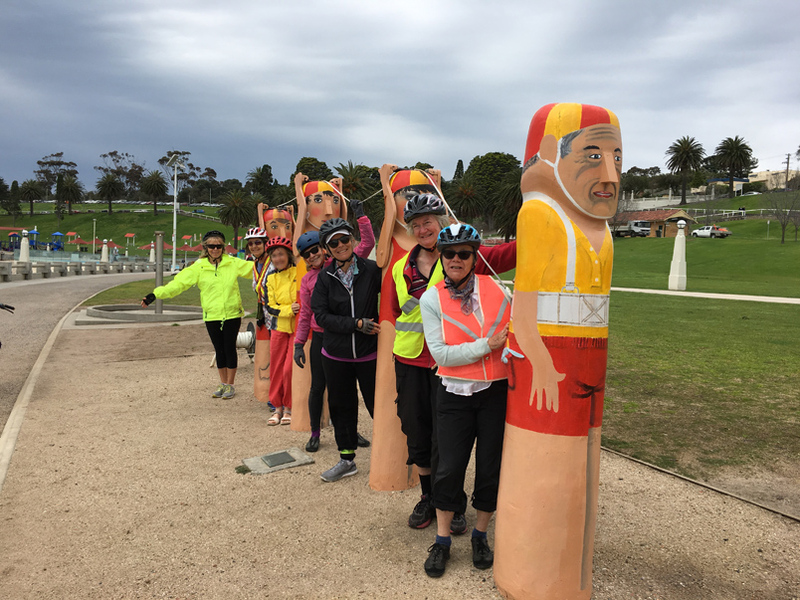 This delightful ride is along the Barwon River and the beach at Geelong. It is a circuit from South Geelong Station. The ride starts along the iconic Barwon River passing sports grounds and going through bushland. There is a road section to Limeburgers Point where the scenic coastal section starts. First off are great views from near Limeburgers Point before riding to the open air sea baths still in use today. One of the main features of this coastal section are the famous bollards. What many people do not realise is that there are lots of them, not just near the baths, but all the way round to Rippleside Park. The ride cuts across from Rippleside Park to the old Fyansford Cement Works Railway. The silos here have recently been adorned with artwork. The path alongside the railway is up a slow gentle incline to the abandoned cement works, a historical Geelong landmark. What goes up must come down and there is a very steep bike track to the confluence of the Barwon and Moorabool Rivers. The final part of the route again follows the Barwon River through wetlands and parks. The final river crossing has great views of the Barwon. There are cafes near the start of the ride. Cafes are also located about two blocks inland from the coast between Malop and Ryrie Streets near Geelong Harbour, and in Rippleside Park. There is a café near the confluence of the Barwon and Moorabool Rivers. Most of these cafes are not open on Sunday. The terrain is mainly flat or gently sloping except for one very steep downhill section. Part of this ride is on quiet roads or roads with separated bike lanes. The Old Fyansford Cement Works. Turn left and follow the trail until you pass under Fellmongers Street. The trail exits onto Gundog Lane. Turn left onto Gundog Lane and the immediately left onto Tucker Street. Turn right into the dedicated bike lane in Fellmongers Street. Turn left into the dedicated bike lane in Boundary Road. Follow Boundary Road to Ryrie Street/Port Arlington Road. Cross Ryrie Street and find the path heading left parallel to Ryrie Street between Try Boys Centre and Ryrie Street. Follow this path to Limeburners Road. Turn right into Limeburners Road. After the golf club Limeburners Road turns to the left. Turn left on the second road after this to reach Eastern Park Circuit and then turn right. After checking out the views make your way down to cross Hearns Road and find the path along the beach. Follow the coast for 3.8km to Rippleside Park which is shortly after a boardwalk. The trick is to stay on the path as close to the water as possible. You will pass the sea baths and the Royal Geelong Yacht Club. Cross Rippleside Park and turn left to ride up to Liverpool Street. Turn right onto Liverpool Street. This turns to the left and becomes Balmoral Crescent. At the end of Balmoral Crescent turn left into Victoria Street. Cross at the lights and use the underpass to cross the railway line near North Geelong Station. Turn right into Giddings Street. At the end of Giddings Street turn left on the trail next to the old Fyansford Cement Works Railway. Follow this to the old cement works. Cross McCurdy Road and slightly to the right pick up a bike trail that goes down to the river next to Hyland Street. Cross Deviation Road and make your way into Fyansford Commons to a turning loop at the end of the car park road near the Moorabool River. To shorten the ride finish at North Geelong Station. There is a side trip at 22. Turn right here and follow the river to the picnic area. Go left uphill to Buckley Falls Road. Take the next driveway to your right to find the falls. You may find it easier to leave your bike in the first picnic ground and walk.